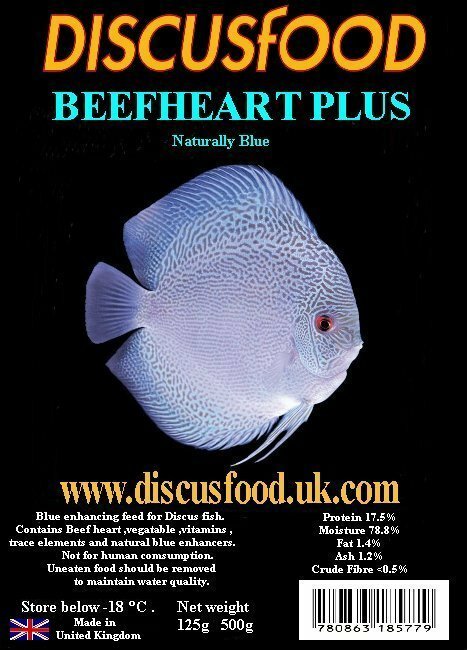 Description: The original frozen " Beefheart Plus " discus food now with added Vitamin C and Calcium helps promote and maintain bone structure in young and adult fish. We have a range of foods available for all size and colour fish via our website. Beefheart Plus adult food 500g slabs are �per slab . This includes a " free " poly box to keep your order frozen whilst you receive it , which we do not charge for. Beefheart Plus 500g Discus food. 1 x 500g slab including free poly box to ensure frozen delivery. 2 x 500g slab including free poly box to ensure frozen delivery.